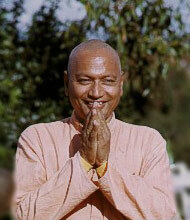 Welcome to the revised Swami Venkatesananda Website. Both a renowned Sanskrit scholar and yogi, Swami Venkatesananda - like his master, Swami Sivananda - can be regarded as a sage of practical wisdom. Focusing on issues that concern and unite all branches of yoga, it is our intention to provide materials that will enrich and enliven your understanding and practice of yoga. Do you usually access SwamiVenkatesananda.org by computer or smartphone? Please let us know. The next three daily readings are shown below. You may also view a complete listing on our Calendar of Daily Readings.